Kitty Hawk, N.C., and Dayton, Ohio, have long fought over the right to be called the birthplace of aviation. Several towns, including Beverly and Marblehead, jostle over where the Navy was born. And rival pizzerias in New York and New Jersey claim to be the nation’s oldest. Now, two of the nation’s largest financial institutions are squabbling over which one was founded first. Bank of America Corp. traces its roots to Massachusetts Bank, chartered in February 1784, through the 2004 acquisition of a successor bank, FleetBoston. 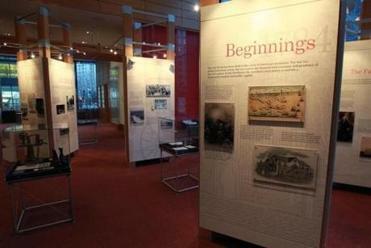 A Bank of America historical exhibit at the institution’s Federal Street headquarters in Boston. But Bank of New York Mellon, founded by Alexander Hamilton as the Bank of New York a few months after Massachusetts Bank in June 1784, insists it is older because it is a direct descendant of the original bank and does not rely on acquisitions for its proud provenance. BNY Mellon’s chief executive, Gerald Hassell, made the claim more pointedly when he addressed Boston College’s Chief Executives’ Club luncheon in Boston last month. ‘‘We are the nation’s oldest institution — the oldest bank — although there are some in the audience who might disagree,’’ motioning to former Bank of Boston (and FleetBoston) chief executive Charles K. Gifford, now a director for Bank of America. ‘‘The dates speak for themselves,’’ said T.J. Crawford, a Bank of America spokesman. Admittedly, Bank of America’s claim is more complicated than BNY Mellon’s. Massachusetts Bank merged with First National Bank of Boston in 1903 and was later renamed Bank of Boston. It was acquired by Fleet in 1999, which in turn was bought by Bank of America in 2004. Excluding acquisitions, Bank of America traces its direct lineage to Commercial National Bank, founded in Charlotte, in 1874. So which is the oldest national bank? Neither one, says economic historian Howard Bodenhorn. Instead, it is probably Wells Fargo & Co., of San Francisco. It turns out that Massachusetts Bank was the second bank chartered in the United States. Wells Fargo, through acquisitions, has ties to the first: Bank of North America in Philadelphia. Bank of North America was chartered by the Continental Congress on Dec. 31, 1781, more than two years before Massachusetts Bank was founded. The bank also counts Alexander Hamilton as an initial stockholder, along with other founding fathers such as Thomas Jefferson and Benjamin Franklin. ‘‘It is safe to say that the Bank of North America [Wells Fargo] beat them both,’’ said Bodenhorn, a Clemson University economics professor and author of two books on the history of American banking. 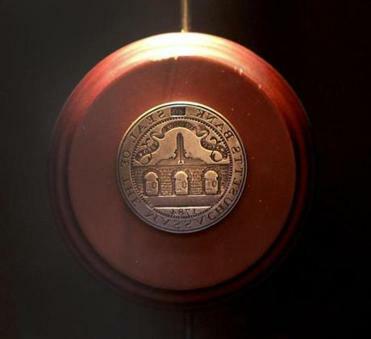 An early seal on display at Bank of America, which traces its roots to Massachusetts Bank, chartered in February 1784. Bank of North America merged with other Pennsylvania banks over the years before it was acquired by First Union, of Charlotte, in 1998. It later became Wachovia. Wachovia was taken over by Wells Fargo during the financial crisis three years ago. Wells Fargo itself was founded in 1852. Some historians give more weight to Bank of New York Mellon’s claim, because the original entity has remained independent since 1784. It kept the original name until 2007, when it took over Mellon Financial of Pittsburgh and combined the new two names. Sylla acknowledges that he may be biased since he lives in New York and chairs the Museum of American Finance, which occupies the former Bank of New York headquarters in Manhattan. Bank of America, meanwhile, says it does not claim to be the oldest bank in the country — it notes on its website that Massachusetts Bank was the second US bank — but is proud of its historic ties to Massachusetts.